Hyman Schandler knew the answer, and it was a resounding “yes!” Having judged numerous high school music competitions, he had found that most of the winners were girls, and he was also aware of the many talented women studying music at Cleveland-area conservatories. 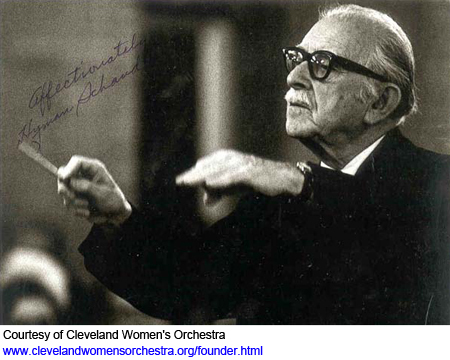 To give female musicians of all ages the opportunity to perform symphonic repertoire, he founded the Cleveland Women’s Orchestra in 1935. He initially held rehearsals in a barn-like carriage house where curators from the Cleveland Museum of Natural History kept caged animals. On November 17, 1936, he conducted the ensemble’s debut concert at Severance Hall, the elegant home of the Cleveland Orchestra. Tireless in his commitment to the cause of gender equality in music, he continued to lead the volunteer orchestra for the next 55 years. Prior to the orchestra’s 50th anniversary concert, he estimated that a thousand “girls” (as he affectionately called his players) had participated in the ensemble. A diminutive man with a twinkle in his eye and the patience of Job, Schandler established high musical standards through a judicious combination of discipline, perseverance, humor and warmth. “He was a marvelous man, a real humanitarian,” said Sabina Berman, a founding member of the orchestra and its principal violist for more than 60 years. “He was like a father, a dear man.” Mrs. Berman, who died on May 9, 2009, at age 93, had also served as treasurer and Mr. Schandler’s “right hand” defacto manager. Born in Riga, Latvia, on August 11, 1900, Schandler emigrated to Cleveland at age three with his mother and three sisters. His father, a tailor, had arrived two years earlier. At age nine, the precocious lad started violin lessons at Bailey’s School of Music, forerunner to the Cleveland Music School Settlement. During his teens, he began conducting choral and instrumental groups and teaching violin at the settlement. There, he met his future wife, pianist Rebecca White. The couple was married in 1926. The following year, Schandler won a post with the Cleveland Orchestra. 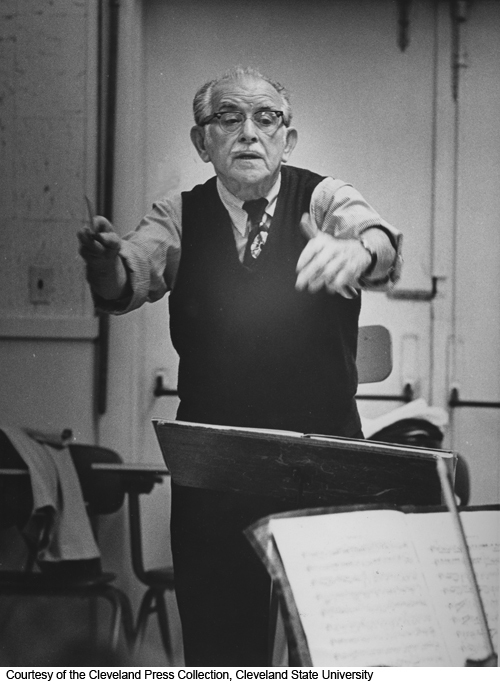 During his 48-year tenure, he played under the direction of the orchestra’s first five music directors. For 37 years, he served as principal second violin. In 1931, he traveled to Salzburg, Austria, to study violin with Theodore Mueller and conducting with Herbert von Karajan. Toward the end of his Cleveland Orchestra career, Schandler moved to the back of the violin section, where he became a mentor to younger colleagues. Following his retirement, he played for two seasons in the Dallas Symphony Orchestra as principal guest conductor, which was then led by 1971 Cleveland Arts Prize winner Louis Lane.